In an open letter, actor Vishnu lashed out at the Movie Artists Association and said that they are too members and nothing was discussed with them before banning Sri Reddy. The last two weeks or so have been a roller coaster ride for Telugu audiences due to the ongoing protests by actor Sri Reddy against the casting couch in Telugu film industry. From stripping in front of the Telugu Film Chamber Office to abusing Pawan Kalyan for his suggestion on her approach, Sri Reddy has done it all and gained the attention of national and international media. After Sri Reddy came out in open, many women artists joined the bandwagon and started speaking out about their harassment experiences in the Telugu film industry. And reacting to this, the Movie Artists Association (MAA) placed a ban on Sri Reddy and also said that any other actor working Sri Reddy would also be banned by the association. The same association revoked the ban few days later after the National Human Rights Commission (NHRC) sent notices to Telangana government and I&B Ministry seeking explanation in the Sri Reddy casting couch case. Now this flipping stand of MAA has irked many actors in the film industry and have voiced out their thoughts on the same. The latest one to express displeasure over MAA taking a decision without consulting any of the 900 members is actor Manchu Vishnu. In an open letter, actor Vishnu lashed out at the Movie Artists Association and said that they are too members and nothing was discussed with them before banning Sri Reddy. Vishnu also added that their knee-jerk reactions were putting the Telugu film industry in an embarrassment position at national and international level. “The recent episode involving a non-member with MAA puzzles me’, said the actor. He quoted the sudden press conference that the association held first urging that 900 members of the association boycott the agitated artist by not acting with her. While it is a clarion call, he said the members included his father, brother, sister and himself are actor/ producers and it is their prerogative with whom to act. Following the boycott, MAA called for yet another press conference and took a U-turn to revoke the ban which surprised many including us. Such decision has put the respectful association in a bad light with media and millions across the world. 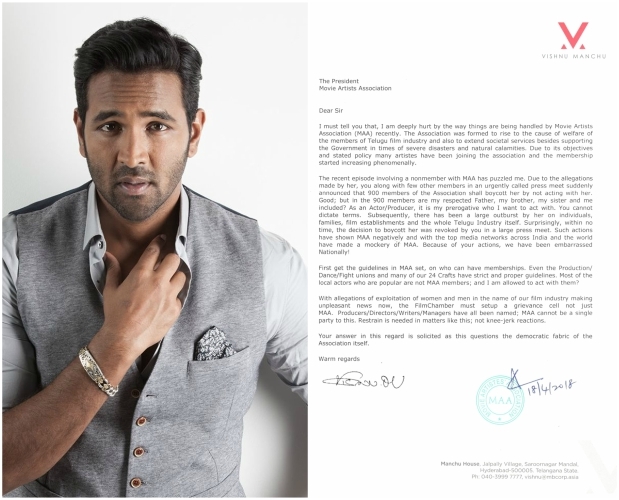 Because of your decision we have been embarrassed nationally,” wrote Manchu Vishnu. So this is a Kamma vs Kapu caste war and not about the human rights of women. Andhraites and their cheap politics.